It's official... I'm married to a 30-year-old! Jon turned the big 3-0 today. One of the med students that he was working with today told him he looked young for 30 and he totally freaked out. I don't think he's ready for those kind of comments, even though it's a compliment! 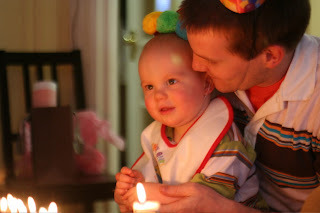 I taught Noah how to say "da-da" in the Happy Birthday song to surprise Jon. We practiced all day and he did such a great job. I had to speed through the pauses because he kept wanting to say "da-da" whenever I stopped singing... it was very cute. Thanks for being such a wonderful husband/father. I caught this video of Noah breakin' it down the other day to a rap version of "Five Little Monkeys" on the new Nursery Rhymes Re-mix he got for his b-day. He only dances like this when there's a heavy beat. Unfortunately it's very similiar to the reggaetone that he hears every night above his room. 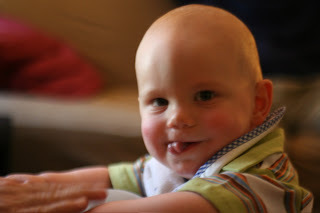 He even starts shakin' it when he hears me mix up his bottle or even scramble an egg. I'm so excited he's inherited some of my music genes. Looks like he's got daddy's moves though. I thought he looked hilarious in his sagging 2T cut-off sweatpants and tight 18-month onesie -- very hip-hop! "Noah, what does the drill say?" Just in case you're curious as to why my son can make the sound of a drill... (the drill is not a part of our daily routine.) Noah loves to try and imitate sounds -- and the drill happened to be one of them... such a boy! 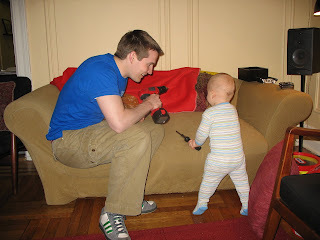 Here's a cute pic of Noah and Daddy working on our latest home improvement project. 1. he only says "mama" when he wants something (this is done in a whiny voice as he follows me around until I pick him up). 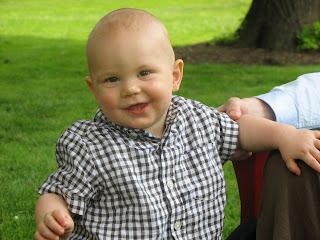 2. he is a total flirt -- especially with 3-year old girls. 3. he loves to dance when he hears any kind of beat or music (even if it's the reggaetone that the neighbors are blasting). He's picked up a few 1-year old tricks in the past few days and perfected some of the ones he's been working on. I am amazed at how much he understands and tries to communicate now. Here's the most recent video clip of his tricks. This really couldn't have gone better if he was an actor! "Woman Falls Through Sidewalk Grate in Midtown"
Unfortunately this headline "Woman Falls Through Sidewalk Grate in Midtown" came true for someone yesterday (click here for the story). This is actually one of my biggest fears about trekking around the streets of NYC. In fact I do everything possible to avoid them altogether, especially depending on the shoes that I am wearing (there's nothing worse that getting your heels stuck in those things!). And I have been scorned to no end about this fear from my husband and little brother. But now we know it can actually happen! So, walk around those sidewalk grates even if it seems like it's out of your way! So, this year I attempted a mother's day project for my mom and Jon's mom. 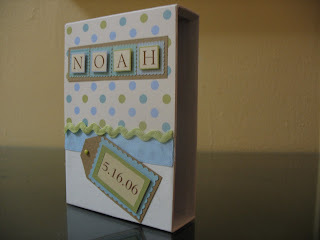 Since Noah's b-day is just a few days after mother's day (yes... it was an interesting day last year!) I decided to put together an album of pictures of Noah from every month of his 1st year. 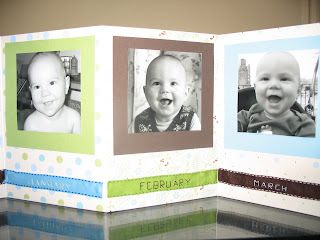 My SIL has done a similar project with her kids' pics so I thought I'd try and put one together for Noah also. I bought an accordian album and printed 12 of b&w pictures of Noah from every month of the year. 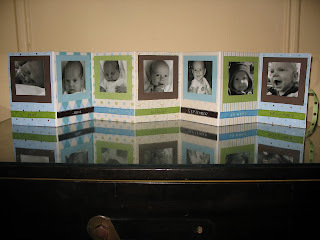 Then I mounted the pictures on cute paper (hours spent in the Target scrapbooking section ) and cardstock. After a trip down to M&J Trimming and $30 later (you can't just buy 1 yard of ribbon) I found the perfect ribbon to label the months with. I embroidered (really just a glorified back-stitch) the names of the months into the ribbon under each picture. 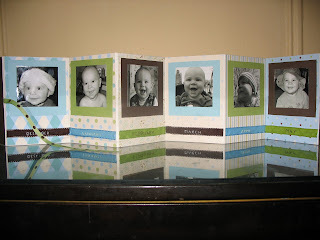 Then I changed out the original ribbon that tied the album together and added a cute polka-dot one to finish it off. 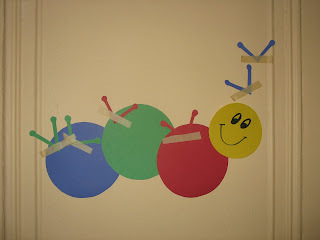 So, this is pretty much what kept me up until 11pm every night last week. But it was well worth-it. I love the way it turned out. 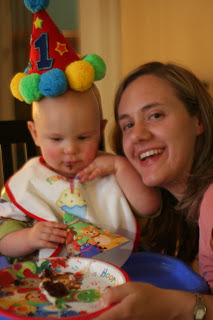 It is absolutely blowing my mind that Noah is a year old today. It definitely has been a crazy year, especially as we were thrown into Jon's residency at the same time as we were adjusting to parenthood - but it really has been an amazing journey. Noah couldn't have had a better day today. He has been battling a cold for the past few days and I have been so worried that he would be fussy all day, but he woke up so cheery and cute and stayed that way all day. He was so chatty all day. He learned 2 new words today ("da-da" and "hi" -- he's been trying to perfect that one for a little while now, but today he started waving and saying "hi" in context). And I am proud to report that I was able to get him to play the recorder that we got him for his b-day! (I'm a very proud mommy/music teacher). Such a great day of milestones. 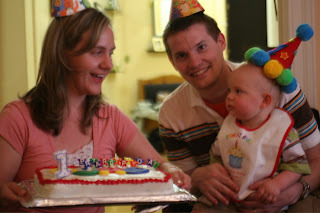 On Sunday we celebrated his big day with my family and Jon's family who were in town. Noah made out like a bandit with lots of awesome presents. I wish I had more time to prepare it, but we had been away for the weekend so I had to sort of throw it together at the end. Not bad for a first attempt, though. 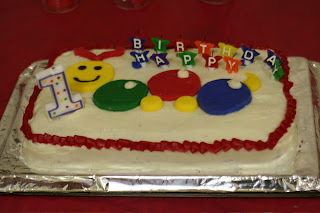 I ran out of red icing and I wanted to do a double-layer version, but I had to get over it , because there was no time for that! Happy Birthday, Noah! I'm so glad you're mine! 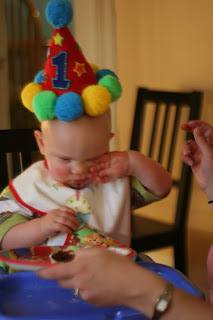 for more 1st b-day pics click here. But lately it seems like that's pretty much how my life works... these things come in spurts: bored... upcoming event... plan/obsess/stressaboutfinishing... blog about it all... bored. Anyway, all of the recent events were hugely successful and really fun. We had a great visit with Jon's family. We got to meet the soon-to-be newest member of the family, Amber (a new SIL to be added in August), we went to my BIL's law-school graduation (so nice to get out of the city even if it was to Carlise, PA), Noah got to meet his great-grandparents and also went swimming for the first time, we celebrated my first Mother's Day with both families, and my little baby boy turned 1! So, hopefully I can catch up with some posts about all that's been going on.